Not strictly a birthday, as all I have for today’s admirable woman is a baptism date, but never mind, it will do. I love those french aristocratic names, they go on for ages. Anyway, so Marie was a writer and the lifelong friend of fellow writer Marie de Sévigné. She married in 1655 and had two sons but was deserted by her husband in 1660. She moved to Paris where she became a great favourite of Minette, duchesse d’Orléans and fell in love with the writer, La Rochefoucauld. She lived with him till he died in 1680. She used th pen name J.R. de Segrais and set up a literary circle. She disapproved of the convent school of St. Cyr, being so close to Versailles because she considered it put the girls at risk from court rakes. 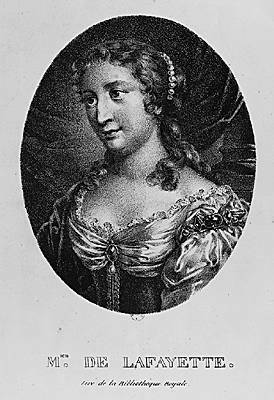 Marie wrote La Princess de Montpensier 1662, Zayde 1670, La Princesse de Clèves 1678 (a lightly disguised autobiography), her final book La Comtesse de Tende was published posthumously. I’ve read La Princesse de Clèves and I have to be honest I found it hard going, but I think Marie was a good sort, especially in the light of her concern for the girls of St Cyr, and her great affection for Marie de Sévigné. believe me, you are the person in the world I have most truly loved. This entry was posted in history, Lesbian, The Historical Birthday-Tea Party and tagged Comtesse de la Fayette, lesbian authors, lesbian history, Marie de Sevigne, Marie-Madeleine de la Fayette, Marie-Madeleine Pioche de La Vergne by Cherry Potts. Bookmark the permalink.